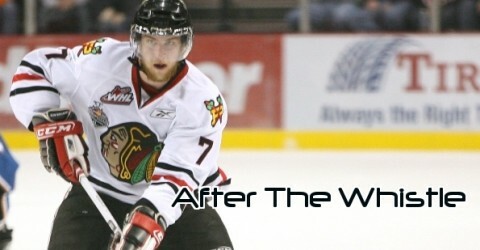 9/30/11 – Tri-City 4 – Portland 1 – Rose Garden: The Hawks entered the game looking to exact revenge for their only loss in the opening weekend against the Americans, and despite getting Sven Bartschi back in the line-up, it was not the performance the home team had hoped for. Portland would be tied 1-1 after the first period, but couldn’t get anything else past Ty Rimmer, who earned first star status with his performance. Ty Rattie scored Portland’s lone goal, a power play marker in the first period. The Americans got goals from Justin Feser, Malte Stromwall, Mitch Topping and empty netter from Zachary Yuen in the win. Patrick Holland had two assists. Portland out-shot the Americans 33-29 in the contest. 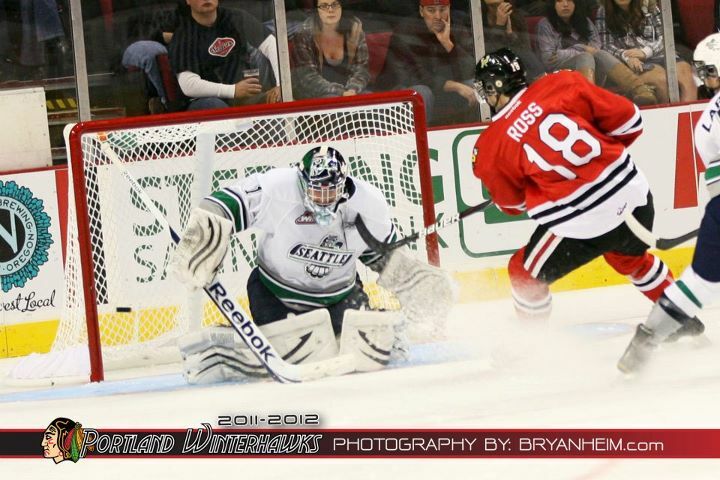 10/1/11 – Portland 4 – Seattle 2 – Rose Garden: For the first time in five games, the Hawks scored first when Brad Ross (pictured above) broke loose on a breakaway in the first period, beating Calvin Pickard to extend his point streak to four games. Ross would then set up Rattie for a power play goal (the fifth of the season for Rattie) and the Hawks would head to the room with a 2-0 first period lead. Chance Lund would close the score to 2-1 with a hard slap shot off the rush in the second, but the Hawks regained their two goal lead when Chase De Leo made a nice play to poke the puck away from a Seattle d-man to spring Ross and Charles Wells on a two-on-one. Ross would feed Wells who made a nice backhand to forehand move, beating Pickard for what would be the eventual game-winner. Marcel Noebels would make it 3-2 in the third, but Mac Carruth was solid in picking up the victory. Derrick Pouliot would add an empty-netter and the Hawks, for the fifth straight game, out-shot their opponents, this time by a margin of 37-28. #1 – Brad Ross — Ross posted 1-3-4 in the two games this weekend to run his point-streak to four games and to move to third in the WHL scoring race with 3-6-9 after five games. He has assists in four straight games, tying a career high. #2 – Ty Rattie — Scored two goals, both on power plays, in the two games. He has six goals, five on the man advantage, to lead the WHL in both categories. #3 – The Penalty Kill Unit(s) — Going a perfect 8 for 8 can’t be overlooked as a reason the Hawks went 1-1-0-0 this week. It starts at the goal with Carruth and extends out to all that took part. With Morrow being returned, the line-up is pretty much set as we know that Ryan Johansen and Nino Niederreiter will start in the NHL. The only uncertainty is Riley Boychuk’s status and that should be cleared up soon. For Friday’s game, the Silvertips will be well rested after having a nine day break between games due to scheduling conflicts in their building. After that, Portland has five straight home games before the long Alberta/BC road trip to close out October and open November. This is a chance to build momentum heading into that trip…and a crucial time to put some W’s in the win column. it is the sign of the times…the NHL has definitely upped the ante on suspensions for what they consider hits to the head and the WHL has followed suit. It is what it is. As of now, the WHL has not adopted any form of communication of explanation for their decisions, so it is all speculation on what the factors were in determining the length of the suspension.